Your guests deserve the best, give them the Arlington Experience! Arlington International Racecourse is the ultimate summer event destination. Dazzle your guests with unparalleled hospitality delicious food & drink and edge of your seat racing excitement. Don't miss Opening Weekend, May 3 - 4, featuring Opening Day fan appreciation and then the biggest and best Kentucky Derby party in Chicagoland. Book your next Group Event at Arlington! BOX YOUR TRIFECTA AND YOUR DAY. Located on the 2nd and 3rd floors, these Luxe, Executive, and Standard Boxes offer a great elevated view of the races. Whether you're looking for a fun and exciting day out with friends and family, a casual and charming afternoon at the races, or a sophisticated and stylish get-together, Arlington International offers an extraordinary experience for everyone! Arlington International Racecourse epitomizes everything about the Sport of Kings, offering the best of Thoroughbred racing in a setting rooted deep in tradition. Racing occurs over Arlington’s renowned turf course and a synthetic main track. The Chicagoland tradition continues with the International Festival of Racing, featuring the Arlington Million, a day that draws horses, owners, trainers, jockeys, and fans from every corner of the world. Arlington International Racecourse is the ultimate summer event destination. Dazzle your guests with unparalleled hospitality, delicious food & drink, and on the edge of your seat racing excitement. Even when the horses go back to their hay, there are plenty of reasons to come out and play with year round group event options ranging from parties, expos, meetings, and weddings. Arlington International features a variety of dining options to host guest outings. We accept dining reservations to the Million Room Restaurant, Terrace Cafe, Cowboy Grille, and Miller Lite Finish Line. Also enjoy walk-up dining at Cobey's Food Court, concession stands, and Mr. D's Sports Bar. Restaurant Hours: Gates open to last race. Mr. D's Sports Bar Hours: Gates open to 1-2 hours after last race. Arlington International is one of the top 10 entertainment destinations in Chicagoland. In addition to thrilling Thoroughbred horse racing, the season is filled with must attend special events ranging from wine tastings to concerts to themed family days. Most events are free with General Admission but, when applicable, to experience the events with the best value, purchase a VIP ticket! The long wait for live racing and entertainment to return is finally over! 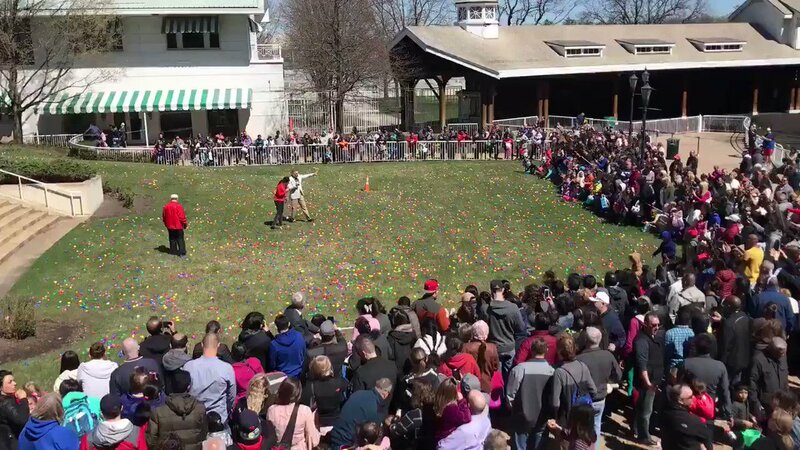 If you can’t be in the Bluegrass State for the Kentucky Derby, Arlington is throwing the biggest Kentucky Derby party in Chicagoland! TGIF! Live racing begins at 3:15pm. Taste and sample wines from all over the world, thoughtfully laid out with entertainment and food in Arlington’s suites. This is your chance to give Mom a unique experience that will create memories to last a lifetime. 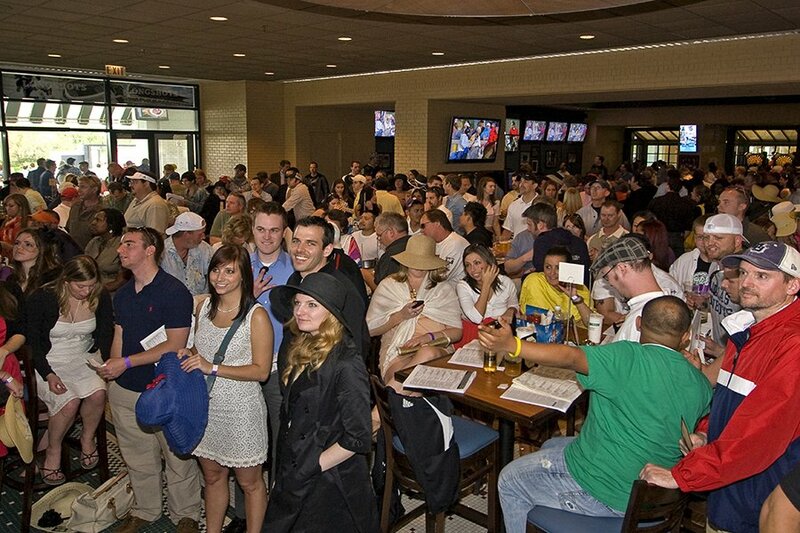 Come to Arlington International to watch and wager on the Preakness Stakes from Pimlico Race Course. Kick off Memorial Day weekend with College Day! Enjoy free General Admission with College ID, live music, $1 specials, and great giveaways! With the unofficial kick off to summer, make it official with great BBQ and all of your favorite American classics in The Park. Food trucks, live music, and a grill giveaway will start the summer off right! Dive into summer with this Family Day+ theme! Experience the depths of the sea with family day activities, a live kids’ concert, amusement rides and games! Memorial Day features special holiday racing and entertainment. At this after work stop, good things come in 3’s: $3 MillerCoors Drafts, $3 Food, $3 House Wine. The ‘Rearing 20s’ will be the bee’s knees and Arlington is the best Speakeasy around! Wake up with the horses and experience Breakfast at Arlington…then celebrate Chicago’s Big Ten Team as Arlington International turns purple and white in this celebration of Northwestern University. Come to Arlington International to watch and wager on the Belmont Stakes from Belmont Park. Celebrate Latino Heritage with this fun-filled Family Day at Arlington! Enjoy a day dedicated to honoring local champions and photo opportunities of the hardware that goes with it! Father’s Day at Arlington has become a Chicagoland tradition. This is your chance to give Dad a unique experience that will create memories to last a lifetime! Can you dig it? Enjoy live entertainment and fun that will throw you right back to the 1970’s. Sensational 70’s Day is free with General Admission, but to experience the event with the best value, purchase a VIP ticket. Show your South Side pride and celebrate the Chicago White Sox as Arlington International turns black, white, and silver for Chicago White Sox Day. Giddy up for this special Country Night theme! Come early for an exhilarating afternoon of racing then stay into the night for dancing, live country music, and themed fun! Name a better trio, we’ll wait. Experience bacon-infused dishes, bloodys with all the fixings, and ice cold beer in The Park! Enjoy all of the fun of a classic renaissance faire! Thou shall not miss this event filled with family day activities, a live kids’ concert, amusement rides and games! Celebrate Independence Day at Arlington with special holiday racing and entertainment! Experience live music and entertainment all day and into the night while the best fireworks display you will ever experience kicks off just after dusk. Join us as Arlington dedicates a day to the human athletes of the sport who pilot our equine friends. Wake up with the horses and experience Breakfast at Arlington…then celebrate our honorable First Responders with First Responders’ Day. Thursdays July-September* are Value Days at Arlington! Value Day features discounted pricing on admission, food & beverage, and seating. Join us for the 6th annual Food Truck Festival featuring over 20 food trucks and multiple live bands! Plus, catch Arlington Million contenders in exciting prep races throughout the day. Bear Down and show your pride for the Monsters of the Midway at Arlington International. Whether you like your whiskey neat, on the rocks, or straight up, this tasting ticket is exactly what you ordered. Tasting ticket also includes beer and spirits. Enjoy a day of racing with your favorite mascots! The day wouldn’t be complete without a mascot race out of the gate on the main track. “Come Together” for this special Beatles Night! Come early for an exhilarating afternoon of racing then stay into the night for dancing, live music, and themed fun! Check out adoptable dogs and ways to help retired racehorses on a fun filled day of horses and hounds! 3…2…1… BLAST OFF! Explore outer space with family day activities, a live kids’ concert and amusement rides & games! Thursdays July-September* are Value Days at Arlington! The ONE-week countdown to the International Festival of Racing begins today! The Arlington International Festival of Racing is THE must attend event of the summer. Make family memories that will last a lifetime with special activities geared towards family fun. Get lei’d as Arlington turns tropical for the day. Experience live racing action & a Hawaiian Luau. Aloha Arlington is free with General Admission, but to experience the event with the best value, purchase a VIP ticket. Every child is a star! This Family Day features a kids’ talent show with riveting performances throughout the day and prizes for win, place, and show! Arlington’s been thrown to the Wolves! Enjoy a day of racing featuring hockey and horses with Chicago Wolves Day. Get wild at Arlington for this Themed Family Day! Experience the “Big Five” and enjoy family day activities, a live kids’ concert, and amusement rides & games. Don’t be a dweeb…get ready for this special 90’s event! Come early for an exhilarating afternoon of racing then stay into the night for dancing, live music, and themed fun! Dust off your lederhosen for Arlington’s Germanfest. Get your fill of Oom-Pah musical beats, beer, and delicious food. Summer has ended and kids and Arli are getting ready to go back to school! 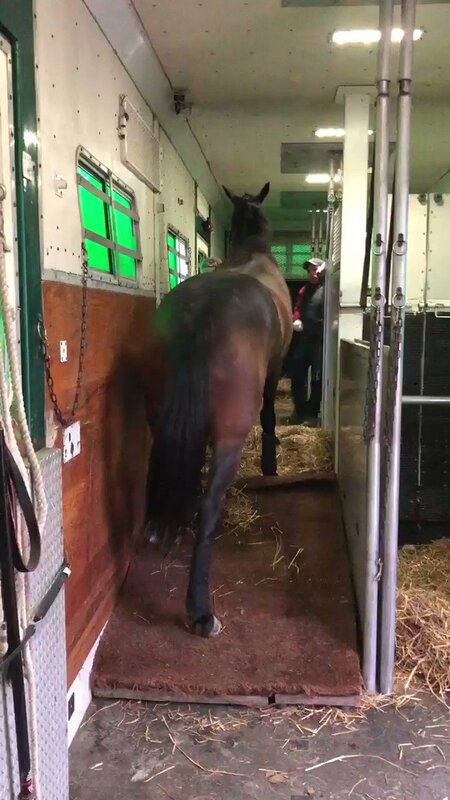 Wake up with the horses and experience Breakfast at Arlington...then come celebrate Arli’s departure and final Sunday Family Day of the season. Celebrate Labor Day at Arlington with special holiday racing and entertainment! TGIF! Live racing begins at 1:25pm. Taste hundreds of varieties of wine and enjoy samples of delicious food all at one of the largest wine tasting events of the Fall. It’s half way to St. Patrick’s Day! Everyone’s Irish for this event! Enjoy Irish music, performances, and great food and beverage specials in the Park. Live racing begins at 1:25pm. 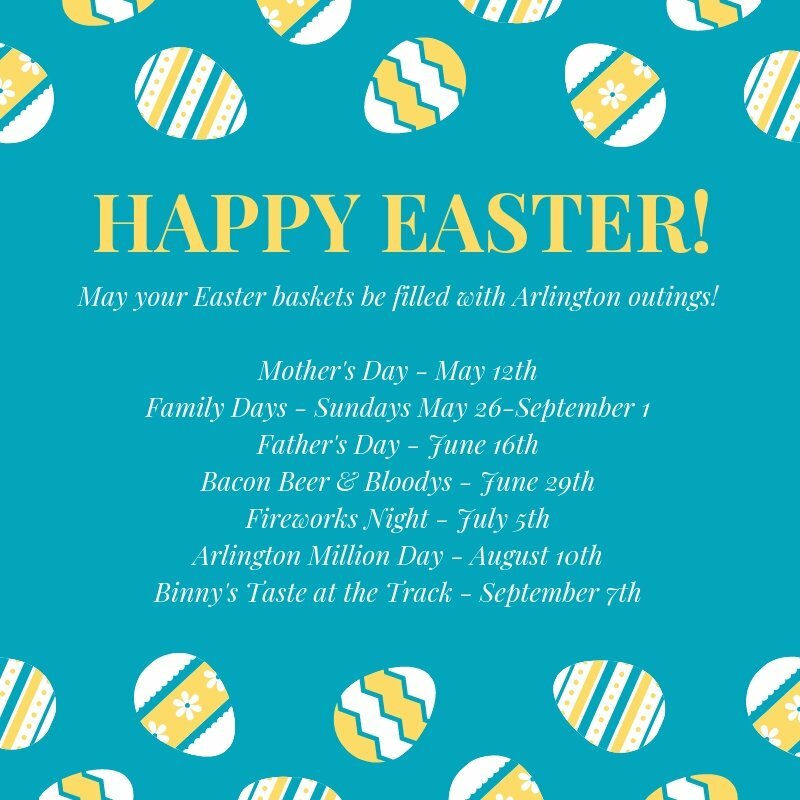 Arlington closes the 2019 season with a multitude of drink specials and giveaways to thank our loyal fans! Follow Arlington on Twitter, Facebook, Instagram, Pinterest, and Snapchat for up to date information, pictures, and exclusive discounts! Win, place, or show…be in the know. Visit Arlington University while you’re at the track or check out our expert picks to help ensure your day is a winning one! Wagering at Arlington is available on mobile, self-service, and by tellers.